Bill Polm, one of our customers, has recently sent us his review of Swift To-Do List. Bill shares with us how he uses Swift To-Do List and which features he likes. About Bill: Bill Polm was a career probation officer in Southern California, near Disneyland. Throughout his career he wrote and painted watercolors to keep his creativity alive. He now lives in Oregon, USA, where he finds lots of lovely scenes for painting, and he is working on a novel. He is a grandfather of 6, and thanks God for all of them and good health at 70! A while back it has been now, I read a post by Jiri on how to format Swift To-Do List to work with Michael Linenberger’s clever strategy for getting control of my workday. Simply put, with Lieneberger’s system (somewhat like David Allen’s Getting Things Done), you list to-dos under 3 categories: (1) Critical Now, for things that must be done today, (2) Opportunity Now, for things that can wait a bit but that I want to get done eventually for sure, and (3) Over the Horizon, also for things I want to do but I’m putting off for longer than those in the Opportunity Now category. These 3 categories are really priorities. Daily, I do the Critical Now tasks first, then read over my Opportunity Now tasks, if and when there’s time, to decide if and which to tackle. The bottom “Priority” is really only a list of my ongoing projects. Also, I find it helpful to take frequent small breaks, especially if the tasks involve a lot of sitting and reading or writing and computer tasks. 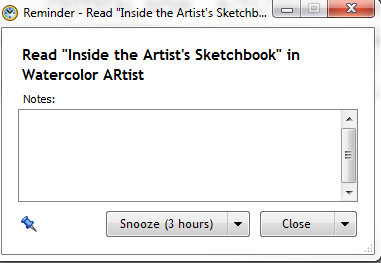 Since I usually have a lot of projects in the works at any given time, I like the “Reminder” function to remind me that I need to schedule and work on a particular task. I like to work on most my current projects some each day. So Swift To-Do List helps me keep that organized so I know what I’m doing and what I need to do next. 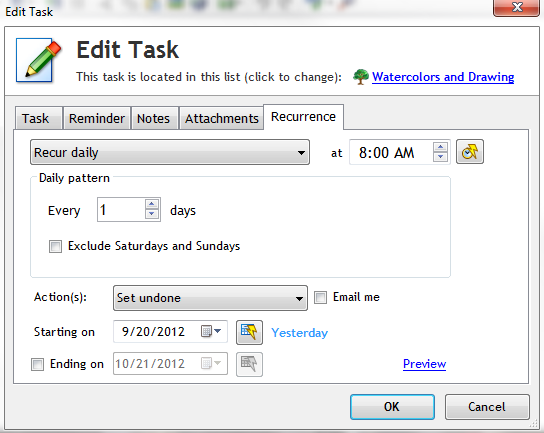 Also, I use the “Recurrence” function to have my tasks repeat. This is particularly helpful to me since I have a lot of ongoing tasks that repeat a lot. 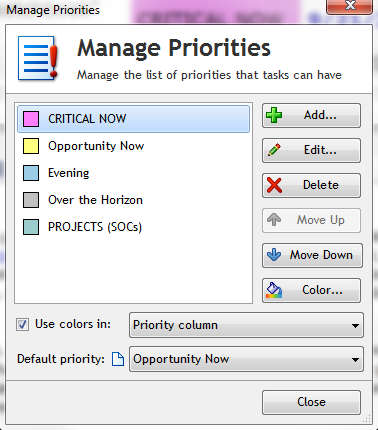 And, for example, within the Opportunity Now category, I usually use the “Recur after task is completed.” This creates another of the same task for me, for the next day, once I put a checkmark in the little square box at the left of the task, marking it done. 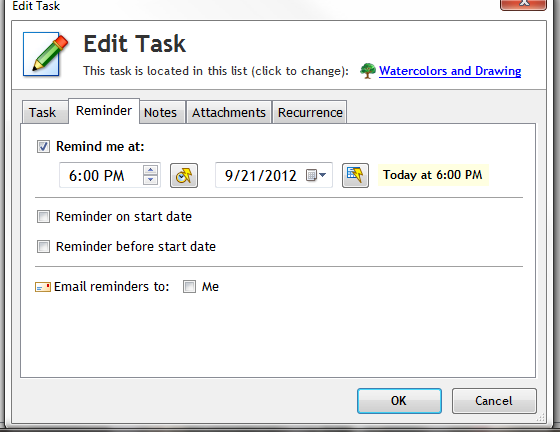 But I also use the Reminder function to pop-up reminders on particularly important tasks within the Critical Now category. My day is usually filled with a number of different things I want to get done, so it’s easy to forget something. 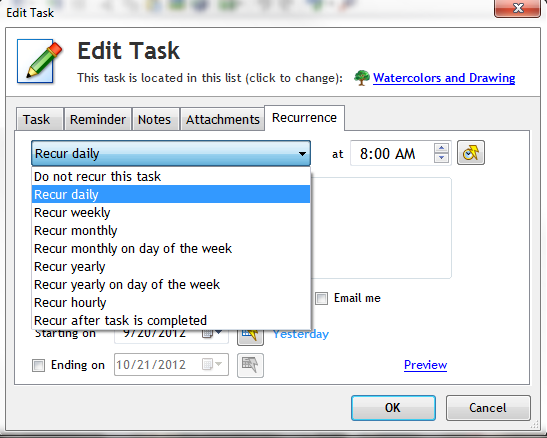 The Reminder function prevents my forgetting–unless I choose to! I can choose any time to the minute, any date. Then the reminder pops up on my monitor screen (assuming I have Swift To-Do List running in the background and click on its button in the tray when it flashes. As long as I have my speakers on, it get a pleasant little “doorbell” ring to alert me). 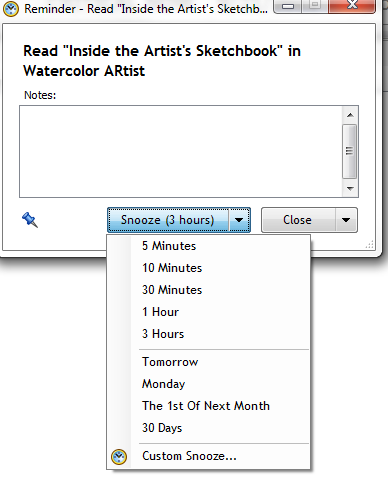 There’s something really nice about a “Snooze” button for an occasional procrastination! I’ve started, recently, using the for lists of things and potential projects. I created a new To-Do List in the Tree called “MEMOS” and then fit each memo under it with a descriptive title, like “Potential Projects” or “Novel Planning Ideas,” etc. Having these memos at the left in the Tree means I can click and read them quickly when I want to refer to them. Also, I use the multi-level numbered lists/outlines in notes to expand my ideas in an organized fashion–very handy, and makes a quick scan of any given list quicker. Summary: Swift To-Do List has a nearly limitless capacity for storing and organizing your to-dos. The Ultimate edition has even more handy features. If you take the brief time necessary to familiarize yourself with the features, you’ll be able to fit your style of getting things done. I am constantly tweaking my setup a bit here and there. It’s easy, and heck, most of the time it’s fun! I’ve upgraded from Tree Notes to this Swift ToDo List 8 program and I’ve very happy with it. I can still use and link up my Tree Notes but the organizer in the To Do program is better than what I’ve been using. Totally customizable. I’m getting organized without having to flip back and forth between different programs as I can link everything together in one place. A little expensive but worth it. I am glad you like the new Swift To-Do List 8! We’ve put quite a lot of effort into it. May it serve you well for years to come – we definitely won’t stop improving it.